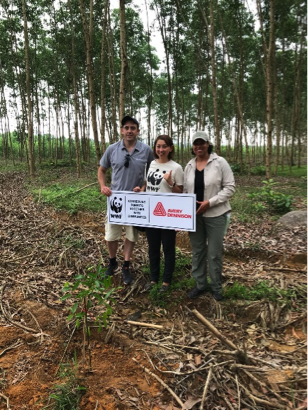 The Avery Dennison Foundation, the global philanthropic arm of Avery Dennison Corporation, has partnered with World Wide Fund for Nature (WWF) to launch a responsible forestry project in Southeast Asia, located in Thua Thien Hue, Vietnam. HO CHI MINH, Vietnam — May 3, 2018 — The Avery Dennison Foundation, the global philanthropic arm of Avery Dennison Corporation, has partnered with World Wide Fund for Nature (WWF) to launch a responsible forestry project in Southeast Asia, located in Thua Thien Hue, Vietnam. The program, which aims to conserve the area’s natural environment and contribute to the social and economic well-being of the local community, will benefit the Forest Owners Sustainable Development Association of Thua Thien Hue province (TTH-FOSDA), an association of FSC® certified acacia plantation smallholder farmers in the province. Through a USD100,000 grant, Avery Dennison and WWF will work with 600 TTH-FOSDA smallholder farmers in improving the quality of their forest through planting high-quality native acacia seedlings to expand forest footprint in woodlands certified by the Forest Stewardship Council (FSC). Other native species will also be introduced to enhance soil conditions, improve water supply quality, and maintain critical habitat for rare species such as the Saola. A portion of the grant will also be used to build the capacity of local stakeholders to establish community-based acacia nurseries. These nurseries are envisioned to help provide local farmers with continued and reliable access to high quality seedlings at lower costs. “This initiative will help restore biodiversity in the ecologically valuable Central Annamites Landscape, with the nursery model becoming a prototype for sustainable development among households. In the long run, this project will lead to job creation and increased incomes for local communities,” adds Nguyen Vu, Project Manager, WWF Vietnam. To further promote sustainability among the smallholders, the program will feature training and workshops that will scale-up existing best practices and practical knowledge in line with FSC standards. The responsible forestry project reflects Avery Dennison’s focus on expanding awareness of the importance of sustainable paper sourcing across Southeast Asia. Avery Dennison now sources approximately 60% of face paper from FSC-certified sources across Southeast Asia and by 2025 the company aims to only use paper with origins that are 100% certified as sustainable, and of which 70% is FSC-certified. For more information on our progress towards our 2025 Sustainability goals, please visit sustainability.averydennison.com. Marcel Cote, strategic marketing director, label and graphic materials, Avery Dennison South Asia Pacific and Sub Saharan Africa; Cindy Chia, corporate account manager, WWF-Singapore; and Alicia Procello, president, Avery Dennison Foundation visit the site for Avery Dennison’s responsible forestry program in Thua Thien Hue province, Vietnam.